After his baseball career, Bernie Williams has managed to remain the center of attention. He has released two jazz albums, one of which has been Grammy-nominated. The Jazz Band was treated to a special collaboration with Grammy-nominated classical guitarist and former New York Yankee Bernie Williams and Garry Dial ‘72 at its annual concert on December 3. Mr. Williams was invited by his mentor, Mr. Dial, who has played alongside the jazz band in the past. Mr. Williams started his two-track career in baseball and music as a child while he lived in Puerto Rico. His mother would often encourage him and his siblings to keep themselves occupied and expand their interests. He then attended a performing arts school, where he started to take athletics and music very seriously. Now, his love of music has stuck with him throughout his entire baseball career and is his central focus now. Mr. Williams said that his upbringing and his move to the United States gave him a diverse taste in music. Genres like Latin, Afro-Cuban, and rock have all contributed to his musical work. He believes that listening to different types of music is the best way to become a successful musician. The duo then joined the Jazz band to play two songs, “Willow Weep For Me” and “Willow, Willow,” which was arranged by Jazz band director Jeremy Fletcher. It was also the last time seniors Akim Louis and Marcellus Blount would play in a jazz band concert. 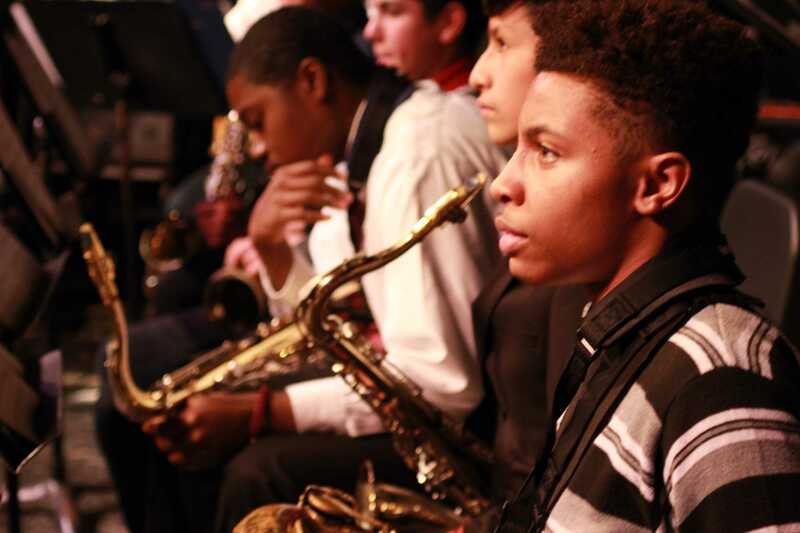 Marcellus said that it was great to have the opportunity to play the saxophone alongside Mr. Williams and Mr. Dial. “It was like finishing off my career with a bang,” he said. Senior Marcellus Blount started playing in the jazz band freshman year and has played in every jazz band concert since then. After the concert, fans of both his music and baseball career lined up to take a photo with the baseball legend. As a baseball fan, senior Stephen Valvano has grown up watching Mr. Williams deliver countless clutch hits and make great plays in the outfield, but it was his first time witnessing his other talent. Photo credit goes to Dr. Dennis Lansang, media corps administrator and science teacher.